As founding member of A Tribe Called Quest, considered by many the greatest Hip-Hop group of time and as a producer for the likes of Nas, Janet Jackson, Busta Rhymes, Solange & Jay-Z the influence of Queen’s native Q-Tip cannot be underestimated so it is only right we clebrate his birthday in style. 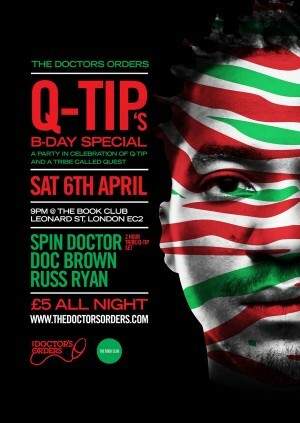 The Doctor’s Orders own Spin Doctor will be spinning 2 hours of classic Tribe, and Q-Tip work to get the place bumping from wall to wall. He is as ever supported by special guest the actor, comedian, rapper and DJ – Doc Brown alongside the incomparable Russ Ryan.